Here’s the International Trailer for ‘Hitchcock’!!! Here is the trailer for ‘Hitchcock’, not to be confused with the HBO film ‘The Girl’. 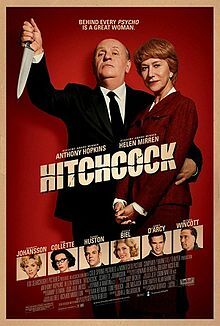 I have already seen ‘Hitchcock’, and I really think it will be nominated for several Oscars this coming year. Anthony Hopkins was phenomenal as Hitch. It was a great film and I can’t wait to see it again. The movie takes place during the conception and premiere of Hitchcock’s ‘Psycho’. Enjoy the trailer. Hitchcock’s ‘Rear Window’ is Headed to Broadway!!! This entry was posted on Monday, November 12th, 2012 at 11:21 am	and is filed under Film, News. You can follow any responses to this entry through the RSS 2.0 feed. You can skip to the end and leave a response. Pinging is currently not allowed. « Check out the International Trailer for ‘Les Miserables’!! !